Image caption Leonard Nimoy, Spock actor, dies at 83. Fans, shocked and saddened by the death of Leonard Nimoy, took to social media on Friday to post tributes to the Star Trek actor and multi-talented artist. Nimoy's last tweet, "A life is like a garden. Perfect moments can be had, but not preserved, except in memory. 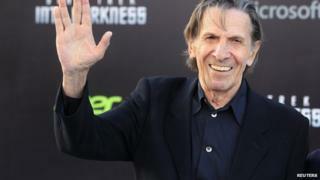 LLAP" was published by the 83-year-old actor in the early hours of Monday morning. The philosophic tweet was retweeted almost 100,000 times and favourited 55,000 times. It became the inspiration for a hashtag #LLAP - for the character Spock's catchphrase, "live long and prosper." Following news of his death on Friday morning, #LLAP was used by over 38,000 people in the space of only a few hours. Nasa was quick to posted a tweet that was retweeted almost 10,000 times: "RIP Leonard Nimoy. So many of us at NASA were inspired by Star Trek. Boldly go..."
Bobak Ferdowsi, who famously sported a mohawk hairstyle for the Curisoirty Mars landing, wrote: "Thanks, Leonard Nimoy, for inspiring so many of us to pursue a better future. #LLAP ." Nimoy's costar in the Star Trek series, William Shatner, issued a remembrance on Twitter. Fans also tweeted out their admiration. "RIP @TheRealNimoy my childhood and adulthood was so much richer with your work. #LLAP," posted @MrKatieCompton. "God speed to a true master of understatement, eyebrow acting guru and my ear hero. He lived long and prospered. One to beam up. #LLAP," tweeted screenwriter, and one half of comic duo Larry and George, Laurence Richard. Tributes on Twitter with photos of the iconic Spock hand gesture were also popular: @SteveStreza posted a photo with the words: "I could never quite do the hand thing. #LLAP" while another, @FoFacy, sent a picture of just their hand saluting the actor with the words: "Good journey, sir. #LLAP"
In addition to acting, Mr Nimoy directed films, published poetry, autobiographies and books of photography and recorded music. Many also took the chance to post links to his lesser-known work and fan sites which covered a wide range of the actor's endeavours: "In case you didn't know this, @TheRealNimoy was a hell of a photographer," wrote ‏@cindyreddeer, who included a link to some of his photo projects. The Star Trek actor died of end-stage chronic obstructive pulmonary disease according to his son, Adam.